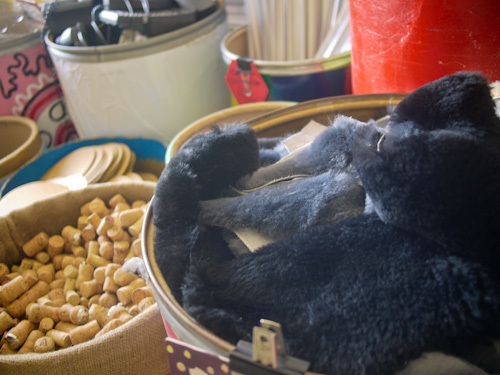 So believe the team at Reverse Garbage — the non-profit co-op that collects industrial discards from businesses around Brisbane and sells them in their warehouse depot in Woolloongabba. 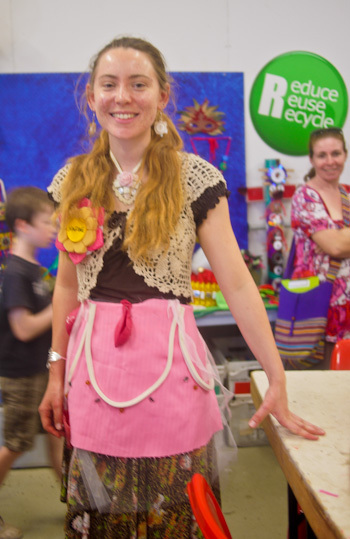 We visited Reverse Garbage today as part of a homeschooling group that was participating in a Wearable Art workshop. 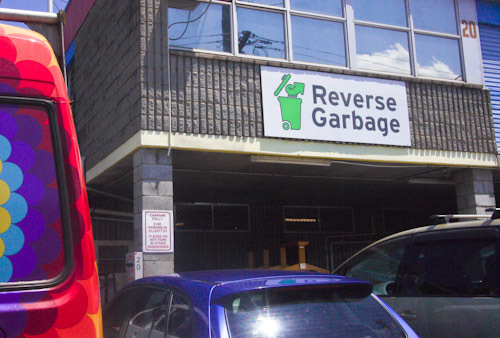 While visiting Sydney last year, we stopped by Reverse Garbage in Marrickville to buy some materials for our truck. Today was our first time at the independent Brisbane establishment. Although it was formed with the help and cooperation of the Sydney store, it is not affiliated with them. 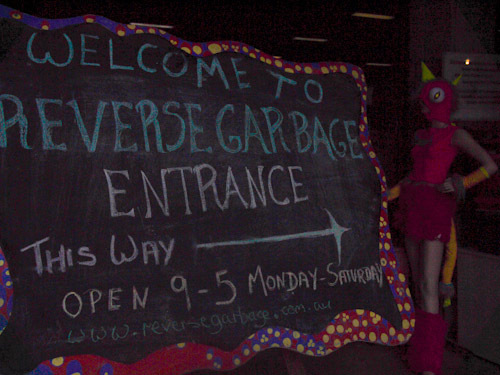 Brisbane's Reverse Garbage is located at 20 Burke Street, Woolloongabba. Even the signage in the store is from salvaged materials. 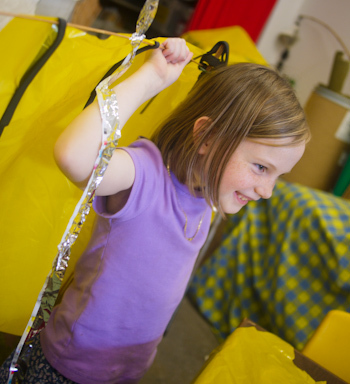 It's a practice at Reverse Garbage to try not to use materials that are bought new, like sticky-tape or hot-glue. Our group is led to a back room where we sit around tables in preparation for the craft activity. 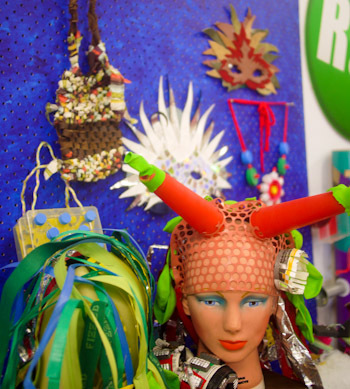 Examples of fantastic wearable art — all made from salvaged materials — are on display to inspire us. 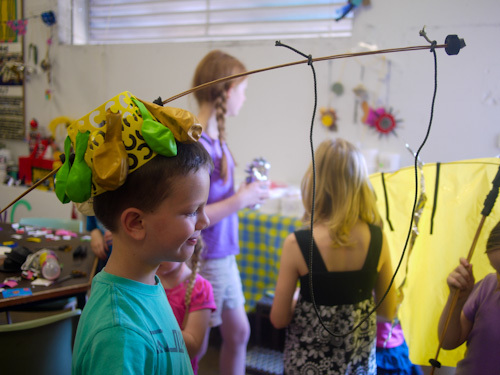 The children are encouraged to make something to hang on their clothes, wear on their heads, around the their waists or on their arms. While she talks to the children, Nina explains what she's wearing and how it was made. 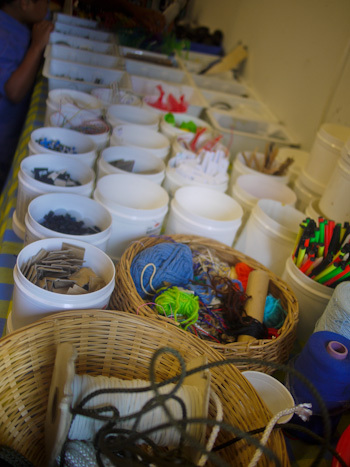 Big tubs and small pots of materials are available for the children to scrounge in. 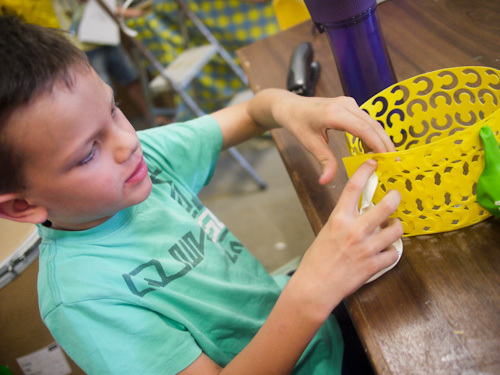 Our friend Alex knows exactly what he wants to make and starts fashioning right away. By the end of the session, he has a magnificent hat worthy of inclusion in P.D. Eastman's Go Dog, Go! book: "Do you like my hat?" It took our girls a bit longer to decide what they wanted to make. We spent some time looking at the exhibits and talking about the materials on offer. 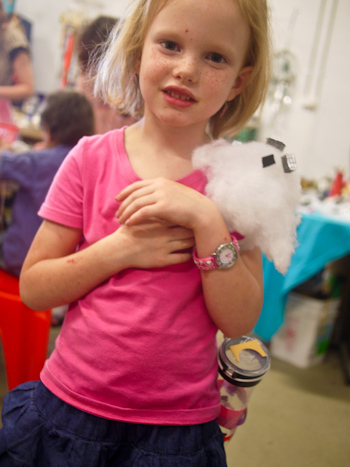 Aisha’s initial reluctance stemmed from her judging the craft materials as not “proper” ones. 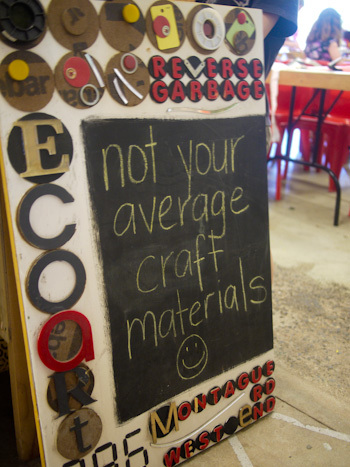 This pronouncement has revealed to me how little I use salvaged materials in the things I make. Now that we’re recycling properly in the bus, I do need to start upcycling more. 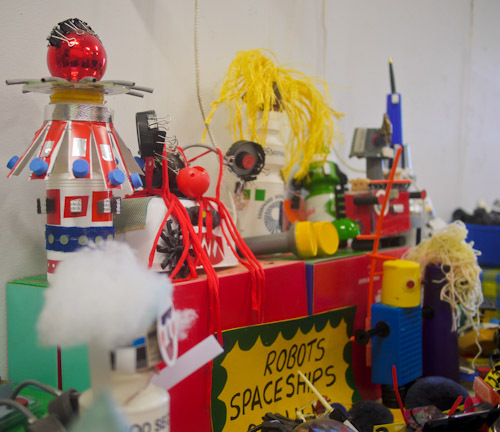 Items from previous workshops offered by Reverse Garbage earlier this year are still on display. Their creativity and individuality are amazing! 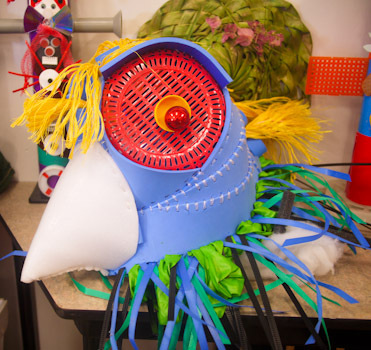 This huge parrot head is worthy of the front of the parade! Brioni finishes with a decorated water bottle on her side and a pet ghost to keep her company. Aisha has fashioned an air-glider like Avatar Aang's. 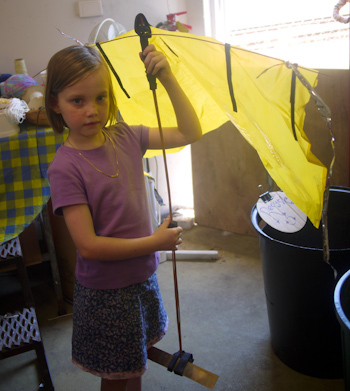 Aisha demonstrates how she'll hang on the glider as it soars through the air. Reverse Garbage pack cardboard barrels full of materials suitable for a range of craft activities and will post these anywhere in Australia. 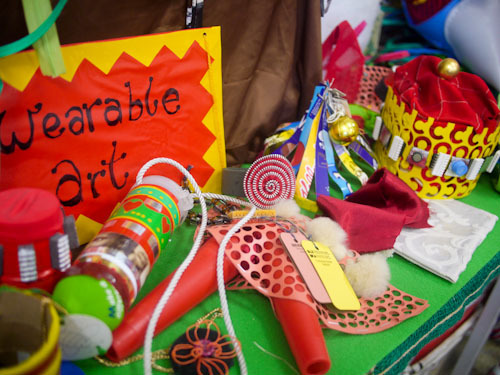 With themes such as Robots & Spaceships, Treasure Boxes, Junk Jewellery, Wonderful Weaving and more, these collections make and interesting and inexpensive alternative to mainstream art and craft supplies. 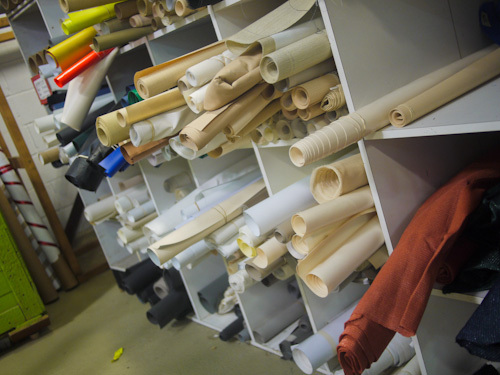 Ever-changing rolls of paper, vinyl and fabric are for sale. 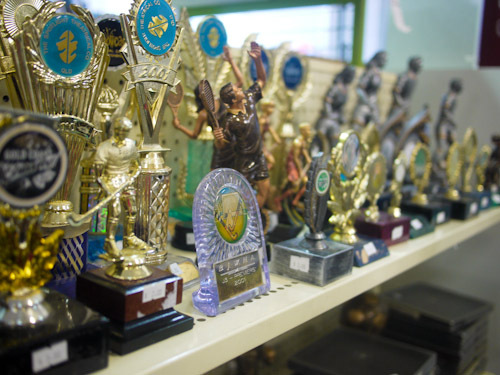 An impressive collection of trophies wait for a new home. How could these be upcycled? Big barrels are stocked with a variety of materials, and these are sold either by the bag or by their weight. Nothing costs very much. Chain mail for a knight costume? Also on the premises, the Reverse Emporium boutique stocks upcycled art, jewellery, clothing and homewares made from salvaged materials. From November 24, they will be showcasing a Festive Collection where the best of local designers exhibit and sell up cycled goods for Christmas gifts. 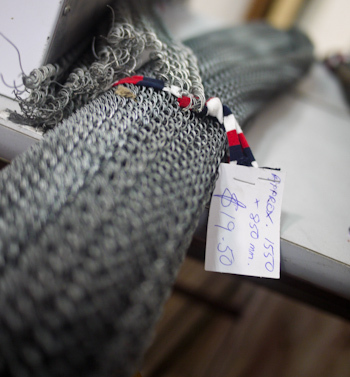 With an ever-changing collection of materials, and new (old) stock arriving almost every day, Reverse Garbage is an interesting place to visit and a great place to pick up materials for projects. 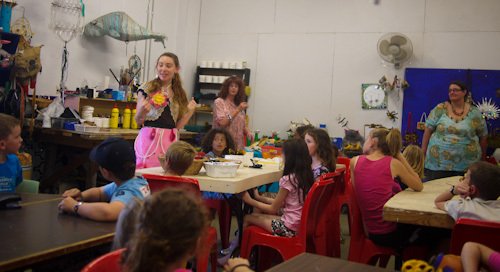 Our girls had a terrific time at the workshop — these workshops run all the time for those who are interested in joining in — and it’s a wonderful way to introduce children to more environmentally-sustainable resources for their imagination! Love her doily vest! The artist who made my lamp shades used to show his work in this shop. Up cycling is the best! I love sequin waste as gift wrapping. It is so hard to get, but I see they had some. We have a place like that here called Resource Area For Teachers. I can go in there and buy a whole basketful of stuff for a few dollars, great place. Here’s trophy-usage ideas – I saw this on Pinterest months ago! When we first moved to Sydney 7 months ago we went to Reverse Garbage here. I have always wanted to go and there isn’t one in Perth. It was very interesting and exciting and I can’t wait to go back. You look like you really enjoyed the day!